Located in the Dupont Circle area of Washington DC is a rather unique Moroccan restaurant called Marrakech that has great food an a ton of atmosphere. From the moment you enter, you know that you are in some place special. Once you enter in through its signature metal doors, immediately hearing Moroccan music, and seeing a belly dancer, you know Marrakech promises to be a dining experience like no other. It certainly delivered. After we ordered our food, the restaurant provided a tapenade appetizer along with freshly made bread, both free of charge. This hit the spot, and kept us satiated until the rest of the meal arrived. 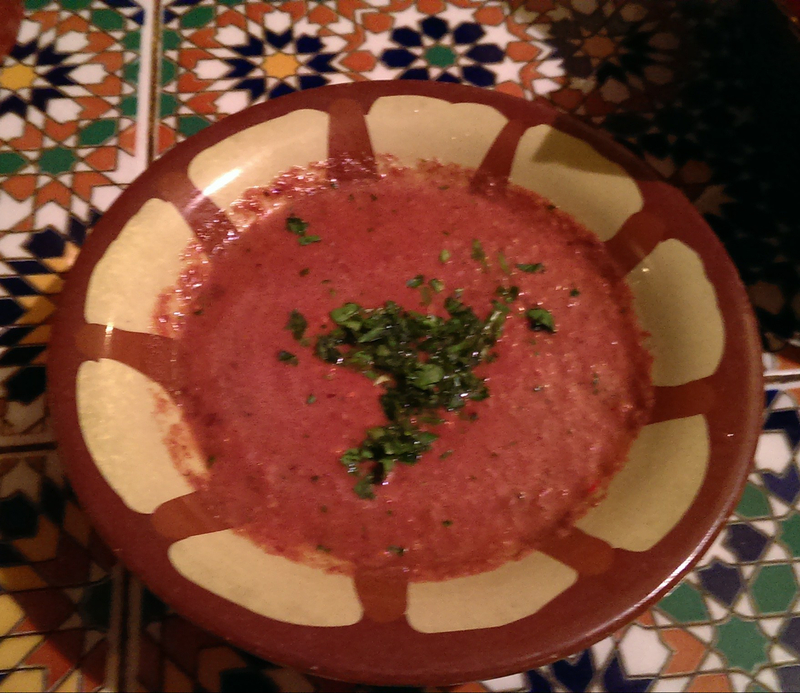 We then continued with Moroccan hot lentil soup. The soup was viscous, but not think, and was filled with lentils. On a cold winter night, this was a great way to begin a meal. 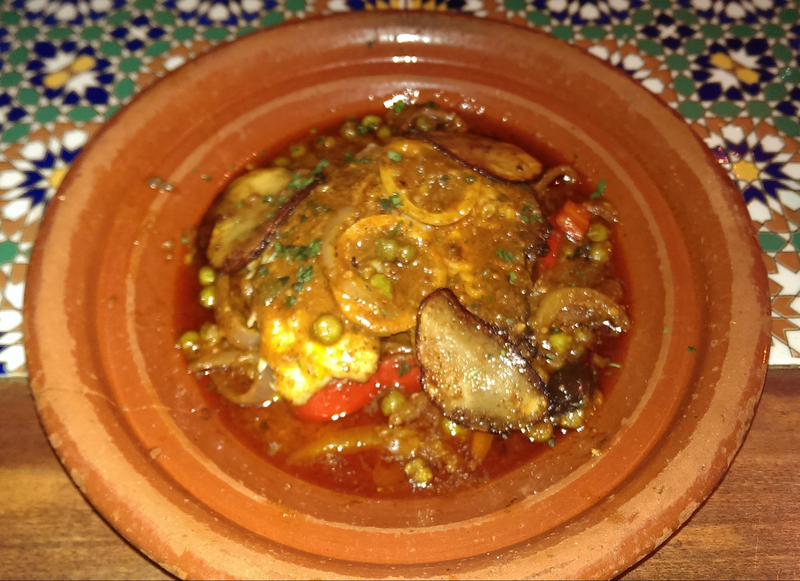 A speciality of the restaurant is a dish called tagine. 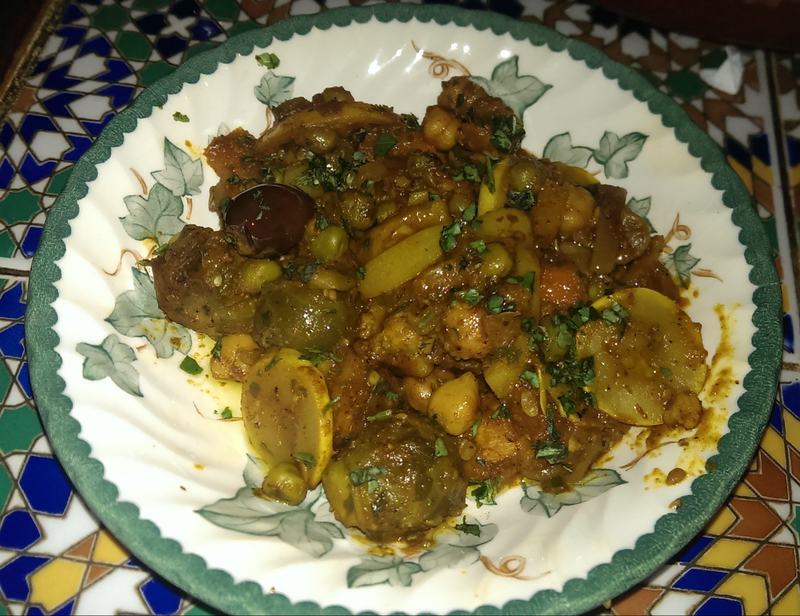 This is akin to a braised stew, cooked and served in a clay pot, the tagine, and seasoned with Moroccan spices. As we were there on a Friday during Lent, we went for the seafood tangine. I had the fish tagine and my companion had the seafood tagine. The fish consisted of a fillet of haddock, while the seafood was a mix of shrimp, calamari, and clams. The flavor is hard to describe, as the dishes had a unique blend of flavors, both sweet and savory, giving it a distinctive taste. What I can say is that both dishes were exceptional. 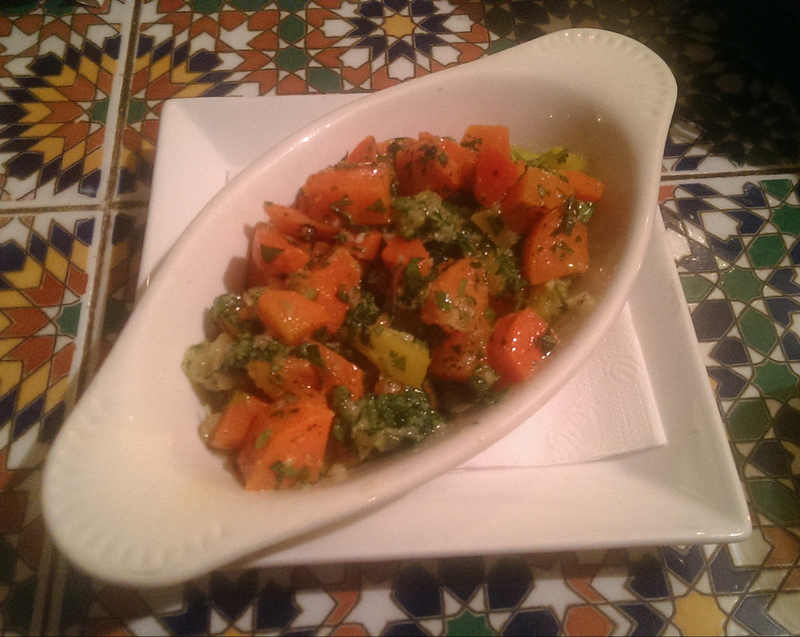 To go along with the tagine we ordered a vegetable dish called Carrot Lakazbah. This was a salad made from carrots and parsley, doused with olive oil and seasoned with an enormous amount of garlic. A simple dish, but it tasted absolutely fabulous. 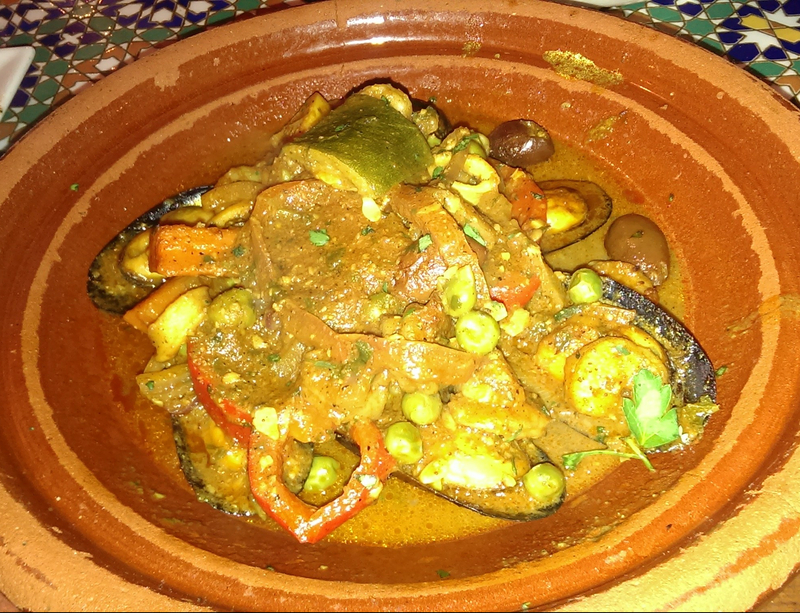 A plate of roasted vegetables was also served with the tagine, rounding out the meal. We finished off the meal with a pot of mint tea, I’ve had mint tea from a bag before, but it was nothing like this. It was freshly brewed and the server poured into our cups in dramatic fashion right before our eyes. Strong and refreshing, it was a great way to end the meal. I found Marrakech to be a fantastic place to finish up a Friday night. 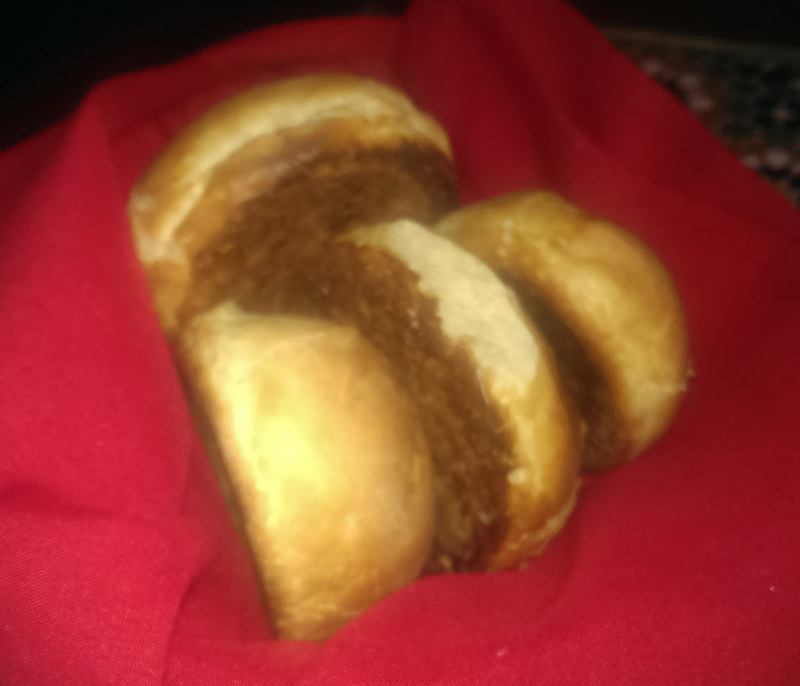 The food was delicious, the atmosphere exotic, and the staff very friendly. I hope to go back soon.